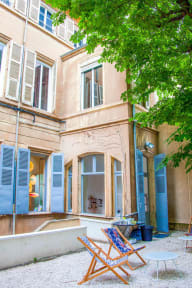 Maison Montgrand Marseille Vieux Port, Marsylia, Francja : Rezerwuj teraz! Located in the heart of Marseille historic city centre, near the Prefecture, a few steps from the famous Old Port of Marseille and its tourist attractions, Maison Montgrand is a charming 3-star boutique hotel which harmoniously combines design and comfort. There are three distinct universes. The main house, set in an elegantly renovated 19th century mansion, includes a concept store, a restaurant, a bar, a tea room, a wellness and beauty room, as well as a 400m2 interior garden. This precious jewel exhibits talents of French designers on one side, and offers a catering space on the other. It embodies the union between aestheticism and taste. The two annexes, dating from the 18th and 19th century and completely renovated in 2017, are entirely dedicated to lodging. 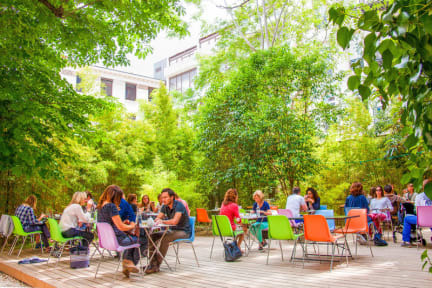 And finally, dance in Marseille by attending the many musical and artistic festivals, and participate to the various events that animate the city and its inhabitants all year round. The soft colours, unlighted with pop touches, energize the interior of the 37 rooms promising calm and restful nights. Above the bedheads, lights take roots in the ceilings and create a graphic game of lines, bringing life into this intimate space. The use of raw materials such as wood, linen and the needle-punched textiles provide a warm atmosphere. Small decoration items and vegetal components add harmony to the cosy atmosphere of the place.